Satay is marinated, skewered and grilled meat served with kuah (gravy) satay, a spicy sweet concoction made of mashed peanuts, coconut milk with a dash of sugar for taste. The meat comes in a variety of preference – chicken, beef, mutton and entrails (perut). Skewers from the midrib of the coconut leaf are the favourite, although bamboo skewers are often used. The meat is grilled over a wood or charcoal fire. To add value, sliced cucumber and onions with ketupat (steamed rice encased in coconut leaves) are served as a package. The pulling factor of satay is its sauce. Lovers will swear by its taste. Satay may have originated from Java, Indonesia but is found in most Southeast Asian countries, especially in Malaysia and Singapore. 14, Jalan Sci 1/16, Dataran Sunway, 31150 Ulu Kinta. Mon-Sat: 5.30 p.m. to 12 mid-night. Chicken and beef at RM0.60 per stick. Ketupat: RM0.50 a piece. 29, Medan Ipoh 1E, Medan Ipoh Bistari, 31400 Ipoh. Mon-Sat: 11.00 a.m. to 12 mid-night. Sun: 2.00 p.m. to 12 mid-night. Chicken, entrails (perut) and beef at RM0.70 a stick. Mutton at RM1 a stick. Ketupat at RM0.50 a piece. Marinated meat is rich in lemongrass. Stall #13, Taman Kanak-kanak, Ipoh; and Aneka Selera (a.k.a. Gluttons’ Square), Ipoh Garden. Mon to Sun: 10.00 a.m. to 12 mid-night (earlier if sold out). Chicken and beef RM0.60 a stick. Ketupat RM1 a piece. 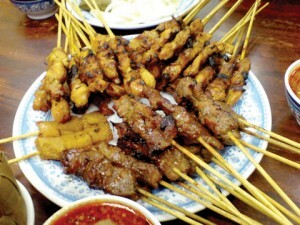 Ample size meat served with thick spicy and nutty kuah satay. Its aroma lingers in the air.